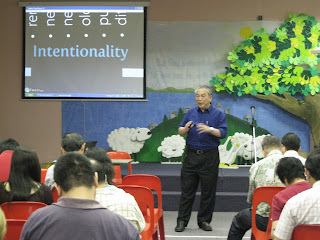 In most Malaysian churches today, teaching on the Christian life is mainly through the pulpit ministry and by various education or discipleship programs. Discipleship is defined as living a life following Christ. Some education or discipleship programs are holistic, resulting in spiritual formation. Dallas Willard defined spiritual formation as character formation. Unfortunately, many education or discipleship programs tend to be individualistic. The emphasis is on building a personal relationship with God only. Though this relationship with God may overflow into relationship with other people, it tends to be a very individualistic Christian spirituality. The relationship is “I and Thou” and the faith community exists only as the medium where personal relationship takes place. The teaching method for these types of discipleship programs are mainly instructional-schooling. Teaching may have occurred but one cannot be sure that learning has taken place. This discipleship programs are mainly designed for behaviour modification (teaching the right “Christian” behaviour) rather than character transformation. One measures the success of these programs by how their participant behaves rather than what character changes have occurred. True learning always involves character transformation. Therefore there is a need for all Malaysian churches an educational strategy that will be effective in character formation rather than church activism. How do members of the Malaysian Christian churches, who are mostly Chinese, Indians and tribal ethics groups process their faith? Asian societies tend to be tightly organized, collectivistic, hierarchical, with greater emphasis on social order and conflict avoidance and more concern with main-zi (face) and group approval. Should Malaysian Christian faith communities follow the same approach of a discipleship program designed in the West and tailored for Western Christians? Western discipleship programs tend to be more individualistic in their approach. This is an important consideration as many Malaysian churches are buying education and “discipleship” programs from the West especially the United States. These “discipleship” programs comes in ‘packages’ which includes a content book, study guides, leader’s guides, DVDs, music CD and sermon transcripts. What is worrying is that churches are using these programs wholesale without analyzing the underlying theological foundation and the fact that these programs are marketed at American Christians. Would it have the same impact in Malaysia where the thinking processes are different? Would the faith development of the Malaysian Christians be more rapid if the educational approach should be more community based rather than an individualistic? Would it retard our own education or discipleship program development? Would it give a distorted view of Christianity as mainly an “individualistic evangelical middle class superpower white male religion”? How does it fit into a multicultural, multiethnic and pluralistic Malaysian culture? There is a need for an educational approach that takes into consideration character formation as its goal, the Asian culture of community rather than individualistic Christian spirituality, and is holistic in developing all aspects of faith development. Such an approach will be powerful instrument under the Holy Spirit as churches become learning communities. While there have been many on-going attempts to develop an “Asian Theology”, there has not been any work done to develop an “Asian Christian Education”. Asia is a major growth centre for Christianity and there is a need for an indigenous contextualized Asian Christian education. Previous Christian education strategies have always been to fit an existing “Western” educational model into an Asian church. It is time to develop Asian or Malaysian Christian education model. for education is very near. up to learn the Lord's truth.